Many development boards are powered over USB, usually via a micro USB ports, and if you have one board, you’d just use a 5V USB adapter with the right amperage, and it will work fine as long as you have a low resistance USB cable (AWG20 cables recommended for higher loads). But when you start to running multiple boards using power strips with USB adapter start to take space, so USB hubs are much more convenient. However, you need to find one that delivers enough power, is reliable, and possible allows per port power control. The guys at LAVA (Linaro Automated Validation Architecture) are using a lot of boards to validate software developed by Linaro and their members, with the boards having to run 24/7, and they had various misfortunes with USB hubs, but as Dave Pigott reports they’ve now found that USB hub of their dream with a 15-port USB hub from Cambrionix which should be their PowerPad 15S model. Each port of the USB Hub can be controlled individually (charging, syncing, or off modes), allows retrieval of VID/PID data, and records power consumption (amps, charging time, total power consumed). The hub can be monitored and controlled using LiveViewer App for Window or Mac OS, but if you want to automate the USB port, for example to power cycle a board that does not answer to ping request, you may want to use the Cambrionix API available for Linux x86/ARM, Windows, and Mac OS. When Dave connect the HUB to his (Linux) laptop he noticed it was detected as a serial device only, and after configuring ser2net, he could login via telnet, and help listed a bunch of commands to control each port. As he connected a Hikey boar, he found a command to check all the ports status with their current draw, so he wrote a Python script to control the port as he wanted. They also found EtherSync Hub from the same company with that’s running Linux, and can be controlled from the network over Ethernet. LAVA team has been running both types of hubs for a while and found them to be reliable, and will update the complete lab with them. 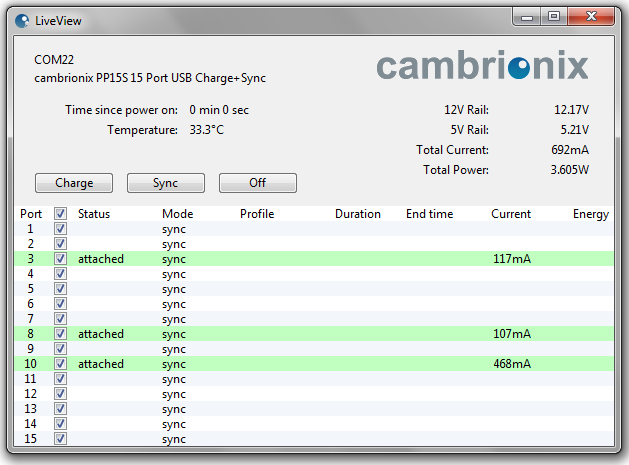 Cambrionix has other USB charging product with various number of ports, and form factor, including a USB charging 1U rack, or a 54-port data transfer USB hub. Check out their products page for details. 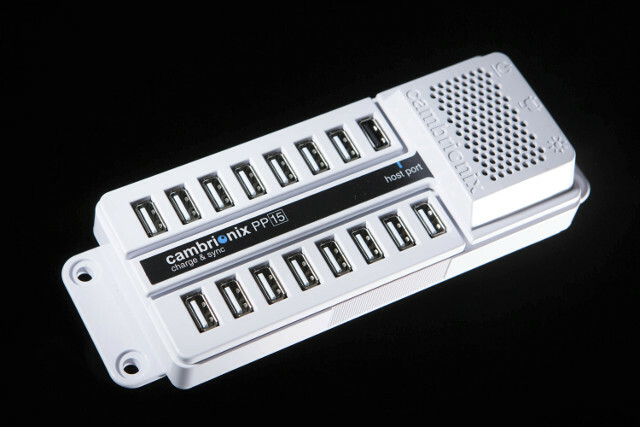 Those are all nifty USB hubs, but as expected price is pretty high with PowerPad 15 sells for $660 on Amazon US (that’s $44 per USB port), and while there are some other cheaper Cambrionix models on Amazon UK, they probably lack advanced functions like power monitoring. [Update: I’ve been informed model PowerPad 15C (notice the extra C) is much cheaper, as it sells for £159 ex vat (~$200) on Multipad UK. The main difference is that it does not support sync mode compared to PowerPad 15S model]. Looks pretty nice but it’s *very* expensive if the intent is only to replace many power adapters. I used to have this problem with my MiQi-based build farms. I ended up ordering some cheap 5- and 6- port power adapters, respectively 50 and 60W for $17 and $20. On such cheap models you can hardly count on more than 60-70% of the advertised power, so I had to “patch” them. In the same price range I found a 10-port model for 60W total power. It seems more solid as there’s no per-port protection (the indicated amperage on the port in fact solely depends on the distance run over the copper lanes between the PSU output and the connector). So in order to run the comparison with this nice power adapter you’ve found (assuming it does really support the indicated power), I’d say that you’d need about five “60W” power adapters to get the same amount of power, that’s already ~$100, to which you can add about $30 for 15 USB power meters. The total price difference comes from the ability to monitor each port’s power level, control them and having everything integrated, which obviously has some value in certain environments. For example when one of my MiQi hangs (it happens if I overclock), I have to poll off the correct cable. With this adapter it might be much easier to reset the port, possibly automatically. I do think it can be very interesting for a lab, but still expensive. I’ve updated post with PowerPad 15C model that lacks data synchronization (not really needed to control boards), but still supports individual port control, power cycling of devices, to record and monitor power consumption (amps, charging time, total power consumed). The good part is that it sells for just $200, so $13.3 per port. It starts to be much more interesting. Would like to find a less expensive controllable USB 3.x hub for backup drives that where I can turn on/off individual drives via simple Command line utility. 3 or 4 port would be perfect. Any suggestions? No info about accuracy. I’m pretty sure the company must have some data about that. What really gets me is that the USB spec already includes per-port power management. Why is it so difficult for people to actually implement the spec, and provide this?